The Galco Waistband® IWB offers functionality and economy. Featuring a reinforced thumb break retention strap, a sturdy injection-molded nylon clip locks the holster onto the belt. The Waistband holster carries the handgun in a vertical orientation, with no cant or angle, so it can be used strong side, crossdraw, or in front of the hip (appendix carry). Constructed of premium center cut steerhide, the Waistband fits belts up to 1 3/4". Very high quality, even better than I expected. I was very excited when my holster shipped but when I put it on I immediately had an issue with the metal plate on the thumb snap. The metal plate kept gouging my side no matter how I tried to position the holster. Not sure if I want to just send it back or try modifying it by sewing something over the piece of metal. Great, just needs a little break in. Very happy with holster and service. I had been looking for one of these "thin" ones for awhile glad I found it. I even ordered another one for another pistol. Tight fitting and all I could ask for. The holster is just what I have always come to expect from Galco, and always received from this manufacture in the past. 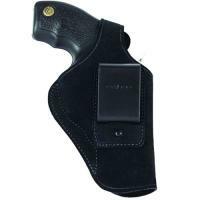 It is something I would recommend to anyone needing a quality IWB holster for their .45 cal. AMT Backup. I do not hesitate to give this a top star rating. One of my favorite holsters. Comfy, priced right, and quality. Can't ask for more. Galco makes excellent products. The model specific inside the pant holsters means that you are not dealing with pieces of velcro. Galco always has great products. Fits well and easily concealable. Well made and a good value,. I like carrying a full size 1911. This holster gives me the added confidence with the retention strap and quality construction of the holster. CopsPlus also ensured the holster was sent to me in quick fashion along with a fair price. Will this fit a .357 smith & wesson 640-1 (shrouded hammer)? Yes, it will fit a 640 hammerless. What is the recommened belt with for this holster? The clip looks very large. This holster will accommodate belts up to 1.75" wide, but I do think it works better on a 1.75" belt as opposed to 1.25 or 1.5.